Aptitude testing for career guidance has existed only since the 1930s. Aptitude testing was not needed until work choice became freely available about 200 years ago. Before that a person had no choice in his field of work. People trained for whatever their parents did. If they had access to patronage or money they could take up a profession. Now, with the concept of Right to Education, governments seek to extend career choice to all socioeconomic strata. With this new privilege of work choice comes the responsibility of choosing wisely. Aptitude testing takes into account abilities, personality, intelligence and motivation for making a career choice. For 10,000 years we did the work our parents did. In the initial millennia of mankind’s existence, work was necessary for survival. Primitive man was a hunter-gatherer to fulfil the biological need for food. As the first human settlements evolved man became a cultivator. He learnt to fashion tools, and make storage vessels. This gave rise to occupations like farming, pottery, and weaving. Densely populated centres evolved, as in Jericho. Families specialised in different trades. Son followed father in the family occupation. Skills were learnt and passed on from one generation to the next. Social hierarchies were formed loosely based on occupation. This often comprised a ruling class of administrators, the merchants, and then the labourers. In India, occupation formed the initial basis of the caste system. Did an individual have the freedom to choose his profession or trade? The Mahabharat tells us the story of Eklavya, a tribal who wished to become an archer. Drona, the greatest teacher of the time, refuses to take him on. Eklavya through an extraordinary feat of dedication and disciplined study becomes a better archer than Prince Arjuna. However, though he had undoubted skill, aptitude and interest; he was not allowed to transgress the rules of society. Martial art was reserved for the warrior caste – the Kshatriyas – and Ekalavya was punished for aspiring to the same. 5000 years ago the first script evolved. Writing of language in a cuneiform script developed in Mesopotamia (Sumer) in 3200BCE. This heralded a radical change in the way knowledge was communicated and disseminated. Education was imparted informally to groups of children until the age of 13-14yrs. Thereafter these usually followed in the profession of their fathers. 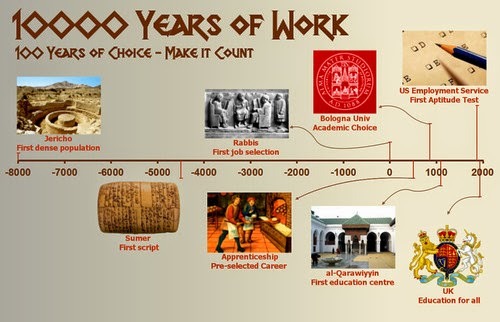 2000 years ago we see the first example of career screening. The Jews selected brighter boys to continue studies as disciples of the rabbi. They would then become masters and rabbis themselves. However, the individual himself had no choice in the matter. 1000 years ago the elite had access to education through universities. The University of al-Qarawiyyin in Fes, Morocco, is the oldest existing, continually operating and the first degree awarding educational institution in the world. An important development in choice of education is the concept of academic freedom. This concept originated in University of Bologna (est 1088 CE, still extant) which was the first to guarantee students freedom in the interests of education. 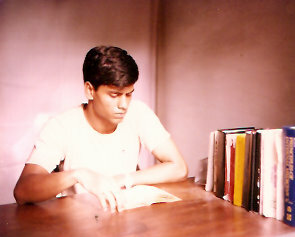 The university also gave students a choice in the curriculum to be studied. However, university education was still for a privileged few and limited to a career in the church or as a professional (law or medicine). 500 years ago formal apprenticeship was first originated. A young person usually between the ages of 10-15yrs was formally bound to a master craftsman for 3-7 years. A supply of labour in a particular trade and a certain standard was thus ensured. In the early 17th century children of paupers and vagrants were put under compulsory apprenticeship – refusal could lead to imprisonment. Later children of the gentry apprenticed to merchants, manufacturers, doctors and lawyers. By the 18th century, apprenticeship existed in every level of society except the highest. However even then, the boy himself had little or no say in his career. Career was dictated by the financial situation of the father and availability of a master. The poor had no choice. 200 years ago educational reforms were initiated when the UK National Education League began its campaign for free, compulsory and non-religious education for all children in the 1870s. Students can now take up any of a whole gamut of ever increasing fields. There is now a surfeit of careers to choose from. Students are now forced to choose between subjects when they transition from secondary school to high school. From an absence of choice they are confronted with an array of career choices. It is now important to choose a career in which the individual has a high chance of success and job satisfaction. 80 years ago aptitude testing for job screening and career guidance was developed by the US Employment Service to improve the fit between the individual and the job. Many other aptitude tests have been developed since. Aptitude tests are used in career guidance to measure different abilities and match them with the requirements of various work fields. Given the importance of work in relation to individual well-being, aptitude testing is now a basic tools in job selection. Aptitude testing combined with assessments of soft skills like personality and work style provides comprehensive data for individual career guidance. However, even today, society at large believes that career decisions happen ‘naturally’. Though so much has changed – higher education is easily available, social and gender restrictions have eased and we can choose to do what we are good at – many of us still follow the path of least resistance and do just as our forefathers did 10,000 years ago. Work style is a combination of personality traits that are relevant and specific to the workplace. Work style is highly predictive of job performance and employee behaviour. Differences in working style explain how people with similar knowledge, ability, goals, and desire to perform differ in the actual performance of their jobs. In today's complex business environment talent selection is critical and is at the top of a manager's list of priorities. Selecting employees for job-relevant personality traits improves job performance in the organisation. 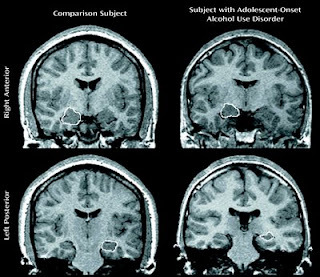 Individuals differ in job performance despite having similar task abilities. The personality traits the individual brings to the organization along with abilities, interests, education, and experience, are responsible for this difference. Personality traits are a major contributor to variations in job performance. The unique personality an individual brings to the workplace is visible as working style - a combination of work habits and self-regulatory ability. Work style has two aspects - work habits and self-regulation. Work habits are patterns of behavior that people learn over time that can facilitate or interfere with job performance. They include characteristic motivational responses such as choices for the amount, intensity, and duration of effort to expend. They explain why you would give the job to Neha in certain situations and to Riya in some others. Work habits include characteristic responses that are not necessarily motivational in nature. This is seen when Rahul, your sales representative who has been trained in the best way to deal with an angry customer and has shown the ability to do so,occasionally reverts to pre-training habits of reacting with hostility. Self-regulation is the thinking process that allocates attention, time, and effort toward attaining a goal. Self-regulation protects an intention from distraction. Priya’s characteristic tendency may be to exert as little effort as possible, but she may choose to go against that tendency in response to the new bonus structure that rewards productivity. Habits influence behavior despite intentions to behave otherwise because they require very little attention. To implement an intention that goes against habitual tendencies and distractions, one must engage self-regulatory or volitional mechanisms. 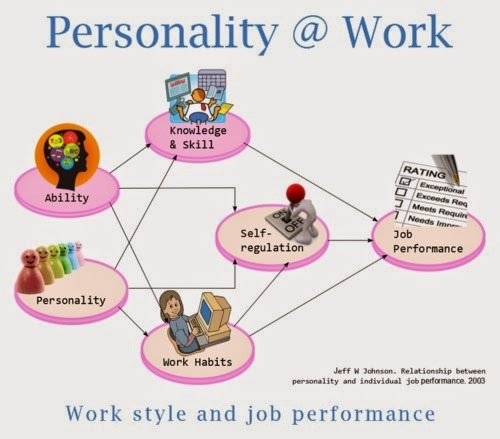 This self-regulatory construct of working style is very important because it is strongly related to personality. reduce overall hiring costs significantly. Work style assessment measures traits such as initiative, integrity, persistence, leadership, stress tolerance, analytical thinking, and interpersonal skills. Higher performance can be obtained across all jobs if one hires employees who are highly conscientious and emotionally stable. Other personality traits (Extraversion, Agreeableness, and Openness to Experience) result in higher performance depending on whether these traits are relevant to the actual job activities. Hiring right mitigates short- and long term damage to the business from a very bad hire. Work style assessment generates a profile of personality traits that can be matched with requirements for successful performance in a particular job. Bouton M, Moore M. J Med Pract Manage. The cult of personality testing: why assessments are essential for employee selection. 2011 Nov-Dec;27(3):144-9.